Celery juice is everywhere for a reason: because it's saving lives as it restores people's health one symptom at a time. From celebrities posting about their daily celery juice routines to people from all walks of life sharing pictures and testimonials of their dramatic recovery stories, celery juice is revealing itself to ignite healing when all odds seem against it. What began decades ago as a quiet movement has become a global healing revolution. 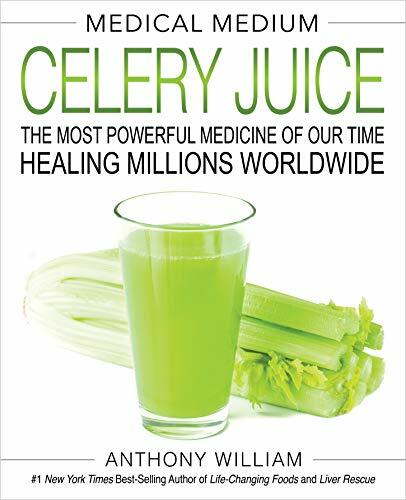 In Celery Juice: The Most Powerful Medicine of Our Time Healing Millions Worldwide, Anthony William, the originator of the global celery juice movement, introduces you to celery juice's incredible ability to create sweeping improvements on every level of our health: * Healing the gut and relieving digestive disorders * Balancing blood sugar, blood pressure, weight, and adrenal function * Neutralizing and flushing toxins from the liver and brain * Restoring health in people who suffer from a vast range of chronic and mystery illnesses and symptoms, among them fatigue, brain fog, acne, eczema, addiction, ADHD, thyroid disorders, diabetes, SIBO, eating disorders, autoimmune disorders, Lyme disease, and eye problems After revealing exactly how celery juice does its anti-inflammatory, alkalizing, life-changing work to provide these benefits and many more, he gives you the powerful, definitive guidelines to do your own celery juice cleanse correctly and successfully. You'll get instructions on how to make the juice, how much to drink, when to drink it, and what to expect as your body begins to detox, plus answers to FAQs such as "Is it safe to drink celery juice while pregnant or breastfeeding? ", "Is blending better than juicing? ", and "Can I take my medications with it?" Here is everything you need to know--from the original source--to receive the full gift of what Anthony calls "one of the greatest healing tonics of all time."